Country Mouse Tales: How Does Your Garden Grow? Did you used to jump rope to that as well? I mean really? Whaaaa? Pretty maids all in a row in the garden? And what is a cockle shell? But anyway, what this post is really supposed to be about is gardening. I love gardens, I do. I read every post that Jen at Muddy Boot Dreams can come up with, I revel in the colors of her garden. It's just that I suffer from a certain affliction...I believe it is called a black thumb. No really, this girl's thumb is practically a blackened whithered stump. I mean, I want to be able to keep plants alive, I really do, but somehow I fail every stinkin' time. It doesn't help that my dog tends to eat anything green, but I still take these failures seriously. Oh you don't believe me? Check it out. That is a CACTUS ya'll. Those are supposed to be hardy. My older sister bought this one for me when I went away to college in Northern New Jersey. That was four years ago. So while I may have been able to keep it alive for a while, I think we can all see that it died a pretty grisly death. Because this weekend, I started a garden. I know...what was I thinking. Now that I am out of the sun and can think a little more clearly I am overwhelmed by my inadequacies in the garden. I feel so...so...inadequate. So far the only thing in said garden are some daffodil bulbs that the previous owner had had down near the creek, which I transplanted on Saturday, as well as a few Gladioluses (Gladiolusii? Gladioluseses?). I meant to take a picture but...well...I forgot. Relatively soon we are also going to be starting a small vegetable garden, and if that wasn't enough for me(the cactus killer), I will also be trying my hand at a very small and select herb garden. I love using fresh herbs in my cooking, and nothing would make me happier than being able to open the door and grab whatever I have a hankering for from my very own herb garden. Of course, for that to happen this garden will need to actually grow. We shall see. So...any advice out there? Do you garden? Anything you have learned from your own gardens? Do you have a wicked green thumb? Or a whithered stump like me? You're brave! I have two black hands - can't really grow anything although I do manage to keep a few plants alive! I hardly ever garden, except to plant a few flowers in pots. Mr. C had a garden when we first started dating, and now we do a garden every year. We give away a LOT of veggies to our family and still have plenty for us! Goodluck! I love having a garden!! Last year was my first attempt at a vegatable garden without my mom's help. Ya, well it didn't turn out too great. Nothing produced any vegatables except my jalepeno plants that is still growing now! I seriously think it has something to do with the soil. My sister in law lives in the same apartments and had nothing grow either. She told me try planting zucchini as that was one of the only things she was able to grow. I tried that and I had tons of blooms and it took over but produced nothing! 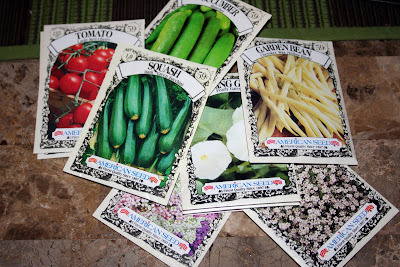 I am trying again this year but will be picking different vegetables. Good luck! I think it's so great you started a garden! 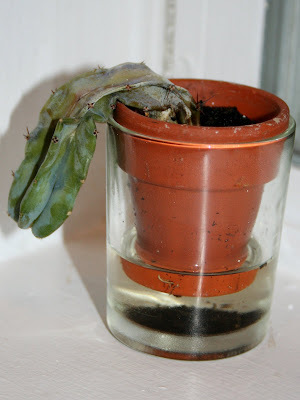 I don't know if I could do it, Garth gave me a rose plant and I watered it everyday and it still died right away! Becka, thanks for the shout out. You make me sound like I know what I am doing, I just never show you the dead stuff. LOL. it is going to be so much fun for you when you pick your first veggies. Why don't you join Blotanical, then you can look up gardeners in your area, and they can give you some tips on what goes into the garden and when. What zone are you? Some of the vegs don't get planted until the soil warms up a little more. The back of the packages will explain to you when they should be planted. And what they want. Blotanical is wonderful, since there is every level of gardener on it, and they are so helpful. There are small pots of herbs available in garden centres and you can just pop them into the ground, that way you don't need to wait for them to germinate. This is going to be your year! You will have success, and some failure, we all do, but that is how we learn. I am so looking forward to seeing what you grow. I've gotten better at gardening with time and a lot of trial and error-just give your garden some regular attention and it is sure to reward you- good luck! Oh I look forward to seeing what happens. I am also planning a garden and have no idea what I am doing....Good luck!! You can find TONS of really great books on gardening at your local library....They were a great help when we were putting in our garden.